Hurricane Maria Devastates Dominica At Category 5, Governor Of Puerto Rico Calls For Evacuations [VIDEO] - Joe.My.God. Hurricane Maria left a trail of destruction as it hit the Caribbean island of Dominica as a Category 5 storm and then battered Guadeloupe with powerful winds early Tuesday. Forecasters warned that the storm could leave some parts of Puerto Rico and the U.S. Virgin Islands uninhabitable for months. 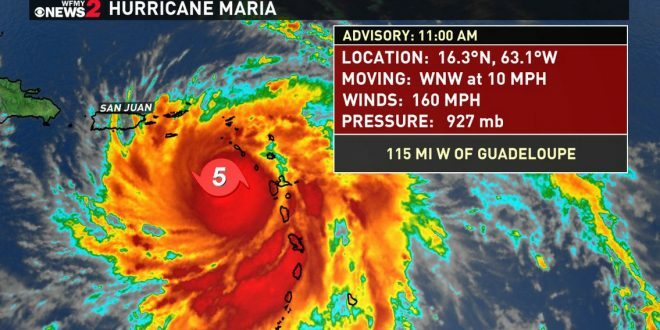 NBC News meteorologist Bill Karins highlighted that Maria was one of the fastest intensifying hurricanes ever recorded. It blew up from a tropical storm into a major Category 5 hurricane in barely more than a day. With hurricane-force winds likely to continue across both territories for as long as 24 hours, forecasters said, Maria was shaping up to be even more destructive than Hurricane Irma, which killed at least 70 people across the Caribbean and the Southeastern United States beginning in late August. Late Monday, President Trump approved emergency declarations for Puerto Rico and the U.S. Virgin Islands and authorized federal assistance and disaster relief efforts.